I've read in more than one place that Captain Phasma is the Boba Fett of the Star Wars: The Force Awakens. I can see why the comparison has been made - both are very cool looking characters that ultimately do very little in the film and are dispatched fairly easily. Phasma is still alive though, so there is still a chance for her to get some redeeming scenes the next time around. I was really disappointed work how little screen time Captain Phasma actually had in Force Awakens. Seemed like she was hyped up in the trailers and then just thrown away. Great pairing, Ross! I honestly don't know who I'd bet more money on (if I were a gambler, to begin with). As for the not-so-good captain? There's a chance she'll have more to do in Episode 8. Who knows? Maybe she'll even turn out to be Jango Fett's granddaughter! Oops! Almost forgot the weird challenge-of-the-week. How about Batman and the Scarlet Witch? Speaking of weird challenges... it just occurred to me that I'd like to see Stan Lee and the Black Cat team up with Green Arrow and Black Canary. Why? Because then we'd have Stan, (Dinah) Laurel, Oliver, and (Felicia) Hardy, and wouldn't that be a fine mess. Great cover! Would definitely read that! 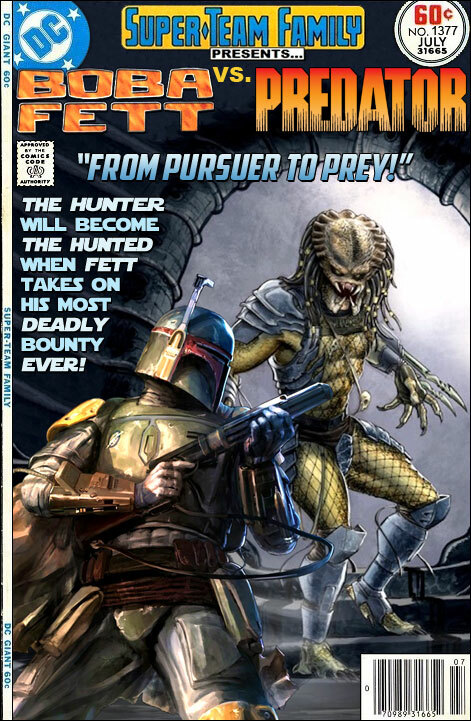 I can't help but wonder what it would be like for Riddick was being hunted by Boba Fett or Predator. Or even better, if Boba Fett or Predator went after the Suicide Squad. That would definitely be awesome. "Speaking of weird challenges... it just occurred to me that I'd like to see Stan Lee and the Black Cat team up with Green Arrow and Black Canary. Why? Because then we'd have Stan, (Dinah) Laurel, Oliver, and (Felicia) Hardy, and wouldn't that be a fine mess." And here's another challenge: Rom Spaceknight and Superman. After all, bearing in mind how DC canonically decided that various other-named dimensions of formlessness were the same place as the Phantom Zone, there's surely a reasonable chance that the 'Limbo' to which Rom was banishing Dire Wraiths with his 'Neutralizer' was also the Zone. @ Carycomic: I agree with Ross. Spidey and Wonder Woman '77 would be more do-ably weird. STF: The Lost Issues on World Comic Book Review!